A fracture that collapses a spinal vertebra as a result of the compression of bone, leading to collapse of the vertebrae much like a sponge collapses under the pressure of one's hand. 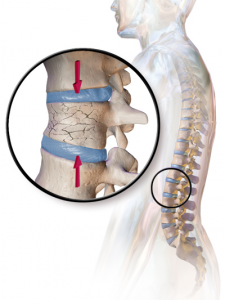 Although they may occur without pain, such vertebral fractures often cause a severe, band-like pain that radiates from the spine around both sides of the body. Over many years, spinal fractures lessen the height of the spine and the person becomes shorter. Treatment is usually with pain medicine, rest, injury avoidance, and bracing, although in some cases surgery can be used. Paramedics and first responders ascribe to the basic tenet of "do no harm." Their routine protocol is to use spinal immobilization for patients with major traumatic injuries, patients whose mechanism of injury is not clear, and patients who may have experienced some trauma. Of course, the initial focus is on cervical spine injuries, and they routinely apply a cervical spine immobilization device, typically a rigid plastic cervical collar. They use a logroll technique when transferring the patient onto a long spine board or rescue board, which avoids unnecessary movement. Once on a spine board, the patient is secured and prepared for transport. Even patients with no spinal tenderness or neurologic deficits are transported in this fashion. The goal of routine spinal immobilization protocols is to avoid injuries during transport and during the prehospital phase. Once in the hospital, remove the patient from the board as soon as practical. Prolonged use may be uncomfortable and even counterproductive because uncomfortable patients may start moving on the board. Some patients develop skin breakdown and decubitus ulcers, even after 1 hour of use. Controlled transfer, use of a sliding board or scoop system, and the logroll technique can prevent further injury. Adequate personnel are needed to facilitate these transfers. Focus the initial assessment and stabilization of patients with spine injuries on the ABCs and patient immobilization. As part of the initial assessment and stabilization, the airway may need to be secured using rapid-sequence intubation and spinal stabilization. Once the ABCs algorithm is satisfied, focus attention on the secondary survey. Quite often, these patients are victims of multiple traumas. Associated injuries, such as brain, thoracic, or abdominal injuries, take precedence. The neurologic examination helps determine the presence of deficits. In the presence of neurologic deficits, hypotension and bradycardia may indicate neurogenic shock. The treatment goal for patients in neurogenic shock is to maintain hemodynamic stability. Maintain the systolic blood pressure at a value of at least 90 mm Hg with a heart rate of 60-100 beats per minute. Initial treatment of hypotension is fluid resuscitation; typical adults may require up to 2 liters of crystalloids. Bradycardia may be titrated by the use of atropine. Attempt to maintain urine output at a minimum of 30 mL/h. If all of the above parameters are difficult to maintain, consider support with inotropic agents. These patients are also at risk for hypothermia and should be warmed to maintain a core temperature of at least 96°F. Place a Foley catheter to help with voiding. A nasogastric tube can help with ileus, which is common in the setting of spinal injury. Priapism is not usually treated. Paramedics and rescue personnel often transport patients on a spinal board with complete spinal immobilization. The objective is to minimize the possibility of injury during transport. Traditionally, patients have been kept on the spinal board until all radiographic studies were completed and no fractures were identified. A more practical approach is to logroll patients off the board, even prior to obtaining radiographs. A cervical collar can be kept in place until the cervical spine is cleared. The objective is to provide maximal patient comfort while minimizing iatrogenic injury. Early clearance from the spinal board can prevent formation of pressure sores and necrosis. Ensure that patients are turned every 1-2 hours to prevent decubitus ulcer formation. Administer pain medication to maintain patient comfort. For patients with blunt trauma injuries and neurologic deficits, consider the administration of high-dose intravenous steroids to help minimize deficits. Begin steroid therapy within 8 hours of the injury. The initial dose of methylprednisolone is 30 mg/kg administered over 15 minutes. Start an infusion for the maintenance dose of 5.4 mg/kg/h at the beginning of the first hour and continue it through the 23rd hour. Recent studies have shown that steroid use may result in complications and inconsistent results. Whether steroid use will continue to be the standard of care for these injuries remains unclear. Fractures may be managed operatively or nonoperatively depending on the extent of spinal cord injury and the overall health of the patient. Minor fractures or those with column stability are managed nonoperatively. Major fractures or those with significant instability can be managed operatively. Operative management is used for stabilization of the spinal column and prevention of spinal deformity, although major factors in nonsurgical candidates can be treated conservatively with nonoperative treatment.